Total L = 266; larger bell W = 95, L = 27, depth = 18; smaller bell W = 78.5, L = 20.6, depth = 19.4; handle L = 238; head L = 45, W = 38, th = 22.8; shaft W = 21, th = 20; thong W = 6, th = 1.5 mm [RTS 6/9/2005]. Collected by Evans-Pritchard himself during his fieldwork amongst the Zande, which took place during 1927, part of 1928 and 1929 and for several months during 1930 [CM; RTS 6/7/2004]. Vessel rattle consisting of two pellet bells mounted onto the top of a wooden handle. One bell is slightly larger than the other, but they have a similar form, made from an oval sheet of iron, doubled over at the centre to form a crescent-shaped body with lentoid plan view that encloses a small iron pellet - one of which is spherical, the other more angular in shape. The edges of the bell have been pressed together at either end, leaving a narrow slit running across the mouth. Each bell has been perforated with two holes across the back, which rests across the top of the handle. The handle itself is carved from a single piece of wood, and consists of a rectangular head and cylindrical shaft. Holes have also been bored down either side of the head, using a heated tool that has left scorch marks and a groove on the shaft below. 2 narrow hide thongs have been threaded up one hole, through the back of each bell, and down the other side, then tied in place at the base of the head with a knot on each side. The handle is a reddish brown colour, probably stained (Pantone 730C); the iron is a metallic silver colour (Pantone 877C) and the thong is yellowish brown (Pantone 7509C). The rattle is complete, with some wear to top and side of the wooden head, while the bells show traces of rust. It has a weight of 125.4 grams and a total length of 266 mm. The larger of the 2 bells is 95 mm wide, 27 mm long and 18 mm deep, while the smaller bell measures 78.5 by 20.6 by 19.4 mm; the handle head is 45 mm long, 38 mm wide and 22.8 mm thick, while the handle shaft is 21 mm wide and 20 mm thick; the total length of the handle is 238 mm, and the hide thong has a width of 6 mm and thickness of 1.5 mm. For a second Zande rattle, with single bell at the top, see 1931.66.4; the two may have been used as a pair. Double bells are also found on the top of 1930.86.60.1-2. These instruments were hand-held, and seem to have been used in ceremonial dances or as musical accompaniment for songs. Evans-Pritchard describes how Zande witchdoctors prepare for a dance; they tie a string of nut clapper bells around their waist, and bunches of orange seeds around legs, ankles and sometimes arms, and hold these rattles in their hands, shaking them up and down during the performance. "As he dances each witch-doctor is in himself a complete orchestra, which rattles and rings and bangs to the rhythm of the drums" ( E.E. Evans-Pritchard, 1937, Witchcraft, Oracles and Magic among the Azande , pp 157-158; see also pls XIV-XVII). 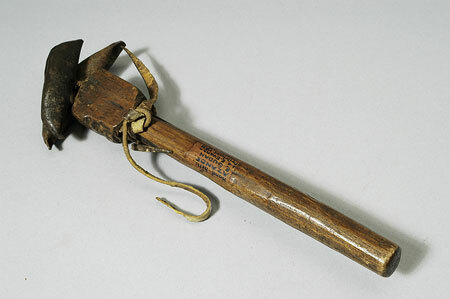 Several images in the Pitt Rivers Museum photographic archive show this type of rattle in use by a group of abinza (witch-doctors, singular binza ) during the do avure, a ceremony that took place as part of the initiation of a new member (see 1998.341.563), as well as by 'song leaders' (1998.341.182 and 1998.341.297). A line drawing by E.S. Thomas is published in E.E. Evans-Pritchard's Witchcraft, Oracles and Magic among the Azande (Oxford University Press, 1937), Fig. 1 (left), p. 158. They are described as 'Witch-doctor hand bells'. Accession Book Entry [IX, p. 16] 1931 [insert, in pencil] 66 [end insert] E. EVANS-PRITCHARD , Esq. Dec. Specimens collected by himself in the EASTERN SUDAN, viz. [insert, in pencil] 4-5 [end insert] - [1 of] 2 Hand-bells, consisting of wooden handles with iron pellet-bell attached to one end with hide thongs (one of them has two of the bells attached) [1931.66.5] . AZANDE. Card Catalogue Entry - There is no further information on the tribes catalogue card [RTS 3/2/2004]. Pitt Rivers Museum label - AFRICA, Sudan. Zande tribe. Vessel rattle with 2 iron pellet bells on wooden handle. d.d. E.E. Evans-Pritchard 1933.66.5 [plastic coated label, tied to object; RTS 6/9/2005]. Written on object - Hand bell, AZANDE, E. SUDAN. d.d. E. Evans-Pritchard, 1931 [RTS 1/9/2005]. Sparks, Rachael. "Zande rattle" Southern Sudan Project (in development). 03 Jan. 2006. Pitt Rivers Museum. <http://southernsudan.prm.ox.ac.uk/details/1931.66.5/>.